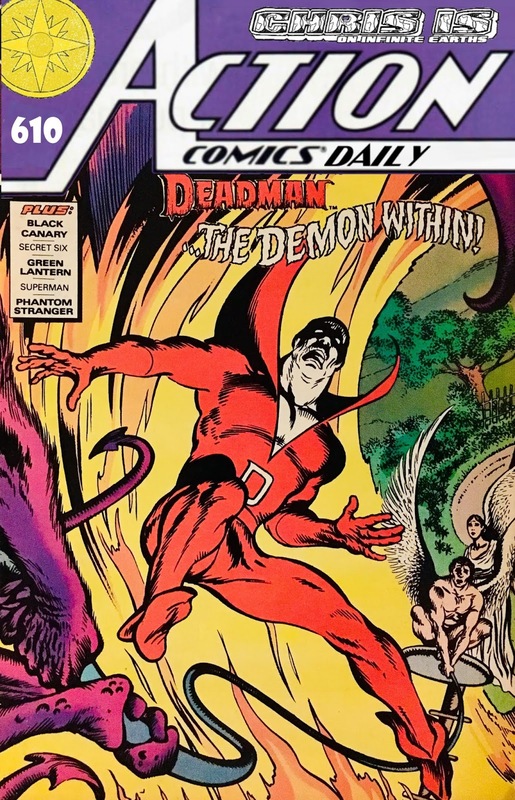 Oh man... it's The Phantom Stranger. Boy, I'm glad there's no Spectre feature in Action Comics Weekly! As our tale opens, we meet a fellow named Kenny Bushmiller... a poor dude who just can't seem to catch a break. No matter what the situation, the outcome never seems to go in his favor. Down in the dumps, and feeling rather persecuted... a hairy-scary demon sees him ripe for the picking. 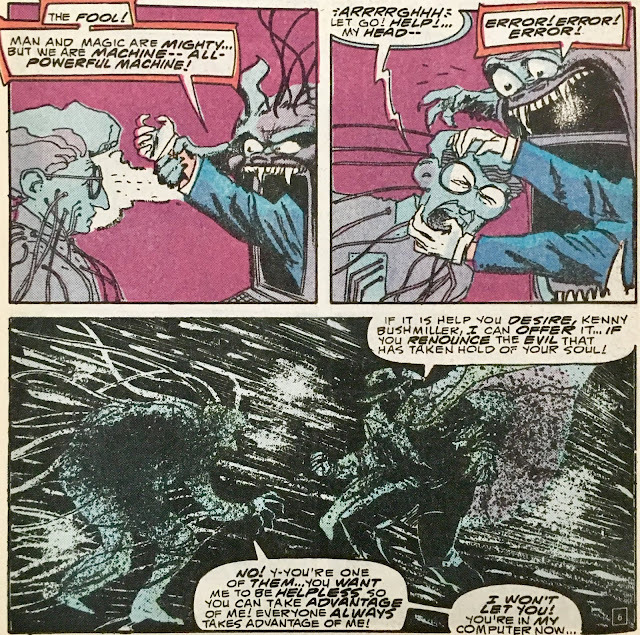 Elsewhere, the Phantom Stranger is chatting up his pal, Bruce "Eclipso" Gordon. This is fallout from the four-issue Phantom Stranger miniseries... that we only made it halfway thru here at the humble blog before tapping out. Back to Kenny! He's in that whole "They'll all be sorry" mode, at which time, his computer appears to come to life (or, be possessed by that hairy-scary demon... and, uh, "interfaces" with him! With his newfound connectivity and power, Kenny decides to exact a little revenge on this unfair world. 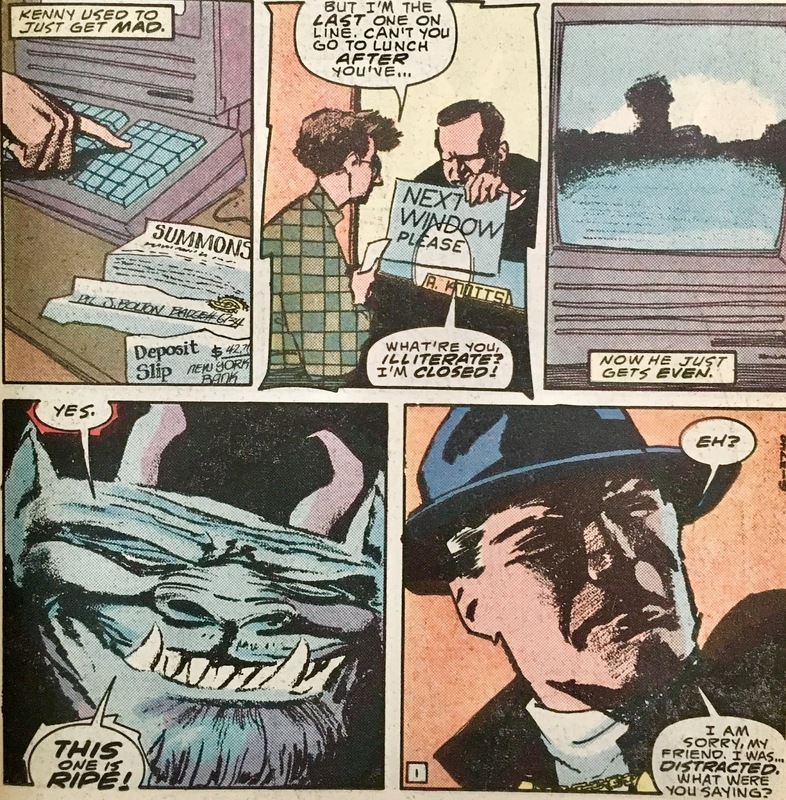 This unbalance is felt by the Phantom Stranger, and he realizes it's up to him to check into this... and so, he hops a ride into cyberspace via Bruce Gordon's telephone. We rejoin Kenny, who just got his gas meter read. He feels like the gas company is screwing with him, and so... he blows up the underground gas main. 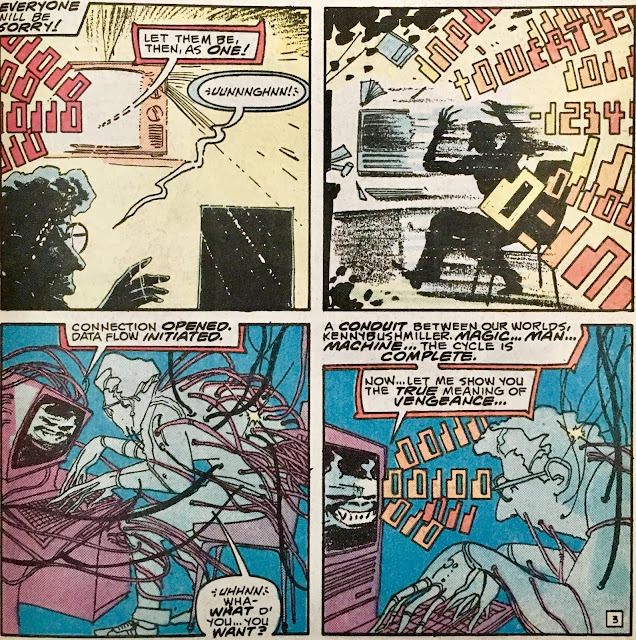 The Demon-PC commands more "input", however, there's something blocking him. Well, more like someone. The Phantom Stranger reaches from inside the monitor, and nyoinks Bushmiller inside. They fight... and the Stranger exorcises the Digital Demon. Annnnd... that's about it! Okay, before we get into the content of this story... I'd like to discuss what this kind of story means in the context of Action Comics Weekly. 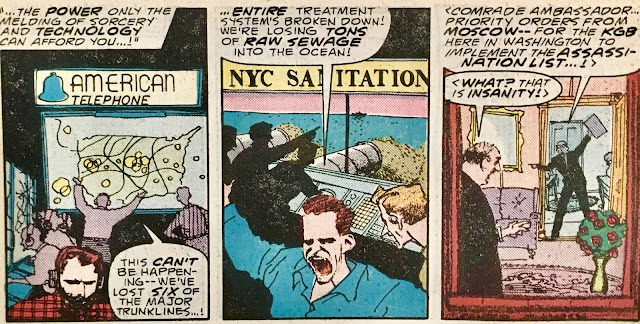 This strange one-and-done sort of story really illustrates the limitless possibilities Action Comics Weekly had. I wish they did more like this. Not that this story necessarily rocked my socks, but it lends a bit to the "wild west" approach to story-delivery that ACW had (in theory). Folks of my generation (and a bit older) will probably have some familiarity with Public Access television stations. You really never knew what you were going to get... it could be the most boring, tedious garbage... or it could be the strangest most intriguing... uh, mostly garbage. This story feels to me a lot like Public Access... and I don't mean that as a slight. 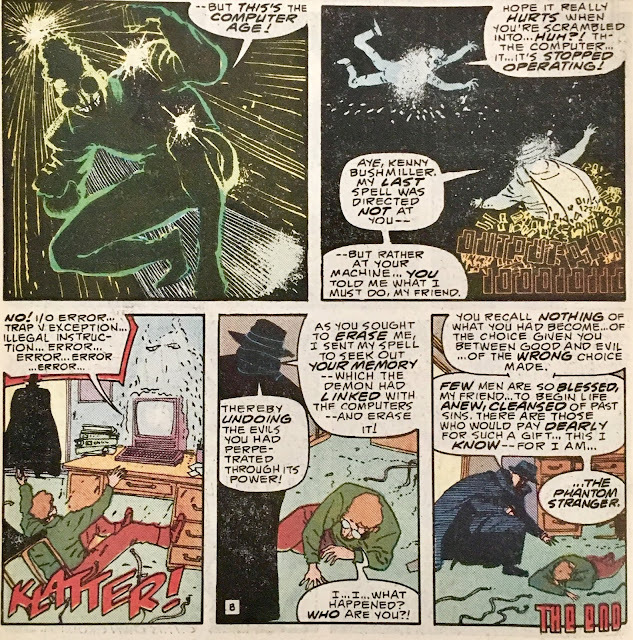 There could be this air of "danger" in Public Access... and I feel had Action Comics Weekly had more oddities like this, it could have as well. 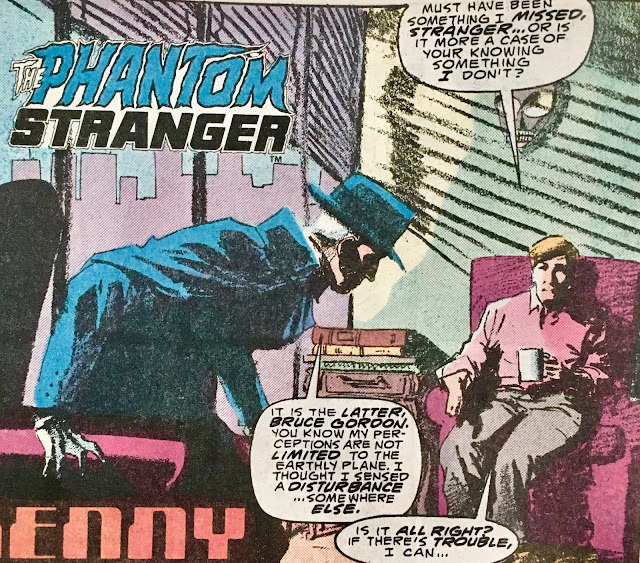 So, a random one-off non-traditional Phantom Stranger story? Like I said, might not have rocked my socks... but, I wish there was more like this throughout the run. We're going to get a couple more... but, to my mind, there should have been a "wildcard" feature every single week. Now... the story. Well, it wasn't the greatest thing in the world... but I didn't outright dislike it. It feels like it both struggled to reach eight-pages... while at the same time, struggled to end at only eight-pages. One thing I will say, the art was very fitting for the tone. If you're a Phantom Stranger fan... you'll probably dig it.